The App Store is rife with options for news junkies. As a news-obsessed iPad user, I decided to pit two such apps against each other in a news consumption death match. On one side sits CNN App for iPad, the 31-year-old news gathering organization that gave us Wolf Blitzer, Larry King, and the world’s first take on the 24-hour news cycle. And now entering the ring is an upstart, a newcomer, the world’s first iPad-only newspaper, from Rupert Murdoch and News Corp: The Daily. There are two criteria to judge news apps upon. I care about the app experience: Are headlines easy to browse? Is the app easy to navigate? Are stories presented cleanly? The other piece, of course, is the content itself. Are the articles informative, current, and well-written? Is video professionally edited? Let’s ring the bell and let CNN and The Daily fight it out. Tile Page: CNN's tile view looks great, but the alternative headline view makes browsing for stories a bit easier. CNN offers three browsing experiences. The default view showcases thumbnails for each story, with headlines superimposed on top. It’s very visual, and I like it, but I don’t love it. Initially, scrolling through the thumbnail view can lead to stutters, as subsequent images load on demand while you swipe. I prefer the decidedly less-flashy headline view, which breaks out headlines by category in a long, scrollable list. CNN’s third view predates the launch of The Daily, but resembles the newcomer a bit. 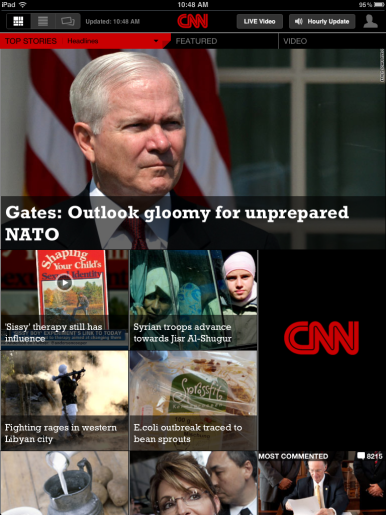 The CNN approach displays one large image and headline per screen, and you swipe to reveal the next story in line. 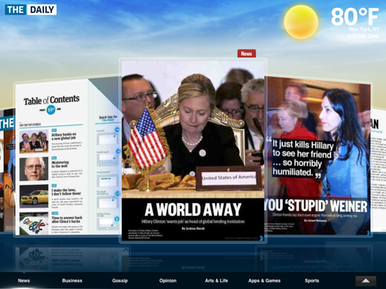 In contrast, The Daily displays a carousel, showcasing each page of the day’s issue—sort of. Taking The Daily for a Spin: The Daily's carousel shows just a few pages at at time. It looks decent, but makes each issue a bit tiresome to navigate. For a multipage story, The Daily just shows the first page of that story in the carousel. You can see about three pages at a time in the carousel view. Each edition of The Daily includes a Table of Contents, too. That table of contents links only to top stories, though—not every headline in the issue. Verdict: I can quickly scan through CNN’s headlines and tap directly into the stories I want to read. Navigation in The Daily clings too closely to the news magazines that predate it, disappointingly abandoning the convenience that modern-day news surfers prefer. CNN 1, The Daily 0. Once you find the story you’re interested in, of course, it’s time to read it. The Daily uses a small font, with full-justified text. You can’t adjust the text size. It’s legible, but were there a control to bump up the size by a couple pixels, I’d do so. 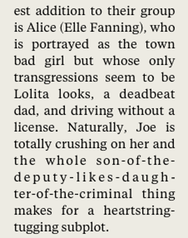 More troubling, when you sit down to read The Daily, is the app’s unusual reading design decisions. Some content is visible only in portrait mode, and some only in landscape. When I was reading in landscape and wanted to look at a recent review of the movie Super 8, I could only see large stills from the film until I turned my iPad to portrait. But when I made that turn, I was confusingly on the second page of the article. There’s no indication in portrait mode that you can see otherwise invisible photos by rotating your iPad, either. Not My Type: The Daily's occasionally narrow columns can lead to especially awkward typography. Occasionally, The Daily relies on a three-column layout, which makes for some very narrow reading, with overzealous letter spacing and hyphenation to keep the text fully justified. You notice the typography in The Daily, and not for good reasons. And while it’s surely my failing, I kept trying to swipe down to advance through longer articles—as you would in Safari, Instapaper, or (spoiler alert) CNN. The Daily’s pagination feels like another relic from a bygone era. The New Yorker iPad app combines vertical and horizontal navigation in clever ways that The Daily should consider emulating. CNN’s app doesn’t offer font control, either. But it does use a much larger font than The Daily, with more line-spacing, too. Unlike The Daily, which features distinct layouts for different articles, the CNN app behaves a bit more like a traditional Web news site: Each article is laid out identically, with a large, scrolling column of text on the left, and social features (like commenting) on the other side. You swipe horizontally when you want to advance to the next story, or just tap the Back button to go the list of all available stories. I find that I don’t mind that each CNN article is laid out identically, because the articles end up feeling eminently readable. Preset Pages: CNN lays out every article identically, but the result is much more readable than The Daily's approach. Verdict: The Daily looks like a news magazine, and doesn’t have to. Both apps could benefit from allowing users to adjust how text looks. Overall, though, CNN’s approach feels both far more readable and for more iPad-savvy. CNN: 2, The Daily 0. Obviously, any analysis of a publication’s content is going to be entirely subjective, but no more so than my analysis of the apps themselves. To that end, when I assess the quality of an app’s content, I’m looking for thoroughness. If I’m going to rely on an app for my daily morning news consumption, I don’t want to find its content incomplete. A recent issue of The Daily opened with a story about Hillary Clinton considering a role with the World Bank, followed by a story about Clinton’s fury over Senator Anthony Weiner’s lousy behavior toward his wife (and Clinton aide) Huma Abedin. The Daily’s headline? “You ‘Stupid’ Weiner.” Next came a story about Alec Baldwin’s take on Weiner, a five paragraph story on Arizona wildfires, a story about a speeding lawmaker, and then a video about excited New Jerseyans auditioning for The X-Factor reality show. 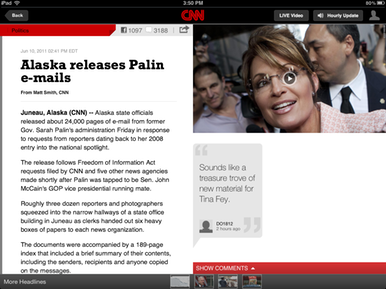 CNN, at the same moment, led with a story on Alaska releasing e-mails from former Gov. Sarah Palin, the Dow dipping below 12,000, a story about Defense Secretary Robert Gates and his fears regarding NATO, and then a story about ongoing fighting in Libya. I be less put off by The Daily’s highlighting of lighter—or less “newsy”—news, were it easier to navigate directly to the stories of interest to me. But I too often find myself paging through fluff to find the stories that I find important. CNN makes the browsing easier, and packs a much mightier news wallop, too. CNN feels like it has everything; The Daily focuses more on a “greatest hits” sampler. And of course, we’re talking about news. Immediacy matters. CNN updates constantly; The Daily updates itself intermittently, a couple times throughout the day. Repeatedly in researching this review, CNN would feature breaking news that The Daily wouldn’t pick up on until the following morning. A (paper) newspaper can get away with reporting yesterday’s news. An iPad app in 2011 needs the latest headlines. On the whole, CNN’s content also skews a bit drier, aiming for a just-the-facts-ma’am approach. The Daily uses news sources like the Associated Press to round out its issues, but articles written by The Daily’s staff tend to sound a bit more touchy-feely than I prefer in my news. Social: Both apps make it easy to connect with Facebook and Twitter; posting updates about stories is easy from each. Both also support reading and sharing comments on articles. This one’s a tie. Advertising: Each app features interstitial ads. With The Daily, you know when an ad is coming because the page takes a beat longer to load. CNN similarly displays full-screen ads as you page through the app; CNN’s ads feature a skip button. Ads in both are annoying, particularly because there’s no option to pay more to turn them off. This one’s a tie, too. Cost: Both apps are free to download. The Daily requires a subscription, though. You can pay a buck a week, or $40 for a year. CNN’s content is free, and this we must award the point to CNN again. Stability and load time: In the course of testing both apps over a couple weeks, CNN’s iPad app didn’t crash once. The Daily didn’t crash daily, but it did crash enough to be noticeable. Frequently, when relaunching The Daily—even if just minutes after last using it—the app spent several seconds preventing me from doing anything, asking me to wait while my issue was delivered. (The Daily doesn’t make it easy to figure out what content has been added since you last launched it, either.) CNN’s app launched quickly and pulled in updated headlines near-instantly. It’s time to call this a TKO. If it weren’t for the ties, The Daily would have been shut out entirely. The final score is CNN 7, The Daily 2. The Daily is the young, hip upstart, but its app wishes mightily to faithfully recreate the paper news magazine experience—to its detriment. CNN’s app, on the other multitouching hand, embraces the iPad as a medium, and delivers better and more current news.